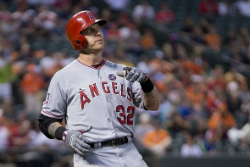 The Los Angeles Angels of Anaheim and fantasy owners everywhere received the worst news possible on Josh Hamilton today. Hamilton will require surgery for a torn UCL in his thumb and will be out for 6-8 weeks! Hamilton was off to a hot start, hitting .444 with 7 runs scored and 6 runs batted in. The Angels have called up J.B. Shuck but will bat Collin Cowgill leadoff tonight. If Shuck gets regular playing time, I like him in deep mixed leagues and AL-Only leagues. I would avoid Cowgill. David Freese is hitting cleanup with Howie Kendrick behind him. Mike Trout and Albert Pujols are going to have to do some heavy lifting for the next two months! With so many potential options this early in the fantasy season, let us know who is available in your league and we will tell you which option we like best!